Holiday songs fill the airwaves on the radio, neighborhoods are full of bright lights and holiday cheer, and shopping malls are full of hustle and bustle. The holiday season is officially here! While you’re busy crossing items off your “To Do” list, burglars are looking for ways to fill their wish lists. During this time of year, thefts and break-ins increase significantly. Unoccupied homes and unlocked cars are easy targets. While insurance may provide some theft coverage, a situation like this will dampen your mood. 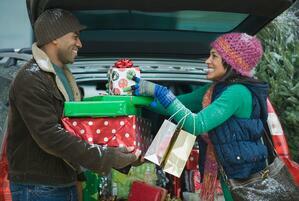 Here are some ways you can ward off holiday theft this year and keep your family safe. 1. Talk to your independent insurance agent. Contact your agent to make sure you have the appropriate coverages. Whether you own or rent a home, you should have the appropriate insurance coverage to protect you from theft and other perils. If you only have the basic coverage on your auto it may not be enough to cover theft, damage or vandalism. 2. Keep an eye on your packages. Online shopping has become so popular and neighborhoods are filled with delivery trucks this time of year. If a majority of your shopping is done online, it’s highly likely a package or two could be stolen from your front porch. Here are some useful tips that may help keep your packages safe. 3. Keep recent purchases out of sight. Whether at home or at the shopping mall, it’s important to keep your bags and packages out of sight. At home, consider storing them in your basement or a closet that’s away from main entrances. This will make the packages harder to find. When at the shopping mall, don’t put the bags in the back seat of your car. Store them in your trunk or hatchback. If you put them in your hatchback, don’t forget to pull the shade to hide them. 4. Document your recent purchases. If your purchases are on the expensive side, consider snapping a photo for documentation. 5. Lock your doors. If you tend to leave your car or home unlocked, you should consider locking it this time of year. Remember, break-ins increase during the holiday season. Also, make sure your windows are locked. Locked windows help keep burglars out and the heat in. For more information, on keeping your home safe, click here. 6. Always be aware of your surroundings. If you’re visiting the mall, before you exit your car, look around before getting out. When you come back with an armful of shopping bags, make sure you’re holding your keys in case you need to press the panic button or get into your car quickly. Here is a variety of parking lot safety tips. Lastly, don’t forget to scan the area when you pull up to an ATM machine to withdraw money. 7. Light up the night. Install motion-activated outdoor lighting. If all the entry points to your home are illuminated, it’s likely burglars will move on to the next house. In addition, consider installing smart lighting inside your home. Smart lighting can be controlled from anywhere in the world and schedules can be created easily. 8. Secure your luggage. If you’re going to be traveling this holiday season, make sure your luggage is secure. I don’t think I’ve ever been at an airport that isn’t busy. However, during the holiday season it’s estimated that 107.3 million Americans travel 50 miles or more from their home. Consider using TSA approved locks on your suitcase or backpacks. After going through security, grab your bags first and then your shoes. Don’t leave your bag sitting at the end of the conveyor belt. Items left on public coat racks. Men should keep their wallet in their front pocket to avoid pick pocketing thieves. 10. Stuff the recycling bin full. Cut gift and electronics boxes into small pieces so they can fit in your recycling bin. There’s no need to broadcast your recent purchases with the neighborhood.